A quick entry of two notable photos. After a not-so-good day, Jeff hands me a little package and tells me to open it. 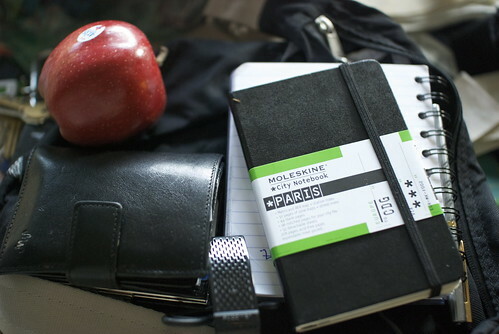 Inside I find Moleskine's Paris city notebook. [what is it?] I see the 'CDG,' for Charles de Gaulle, and I burst into tears, for his spouse is a fountain pen lover who adores little perfect notebooks like these and who is very very nervous about going to Paris alone. "Make your notes here," he says. "It won't be the last time you go to the city." I may not have him with me on his trip, but suddenly I have city maps and addresses, and I have a spousal good luck charm. 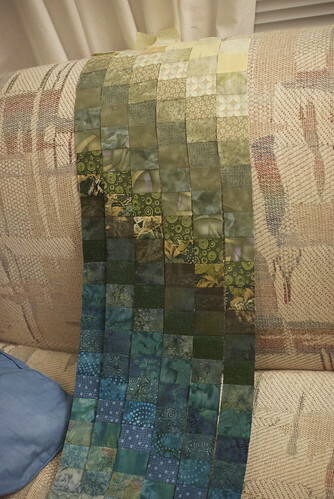 For those of you wondering how the bargello quilt is coming along, I have enough strips cut so you can get an idea of how the color shift looks in reality, not just in photoshop. I was totally going to suggest getting that little Paris guide. I love Moleskine and think that book is just awesome. You are going to LOVE Paris - not a trip to miss for any reason.